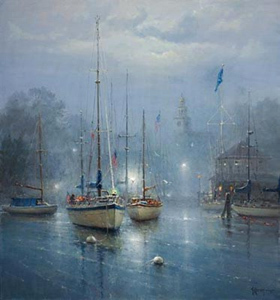 The Slip of Dawn by G. Harvey depicts boats moored in their harbor, safe from the roaring waters of the ocean. The artist fell in love with Nantucket's Harbor, especially at dawn. Fog and mist roll in from the ocean shrouding the harbor. Later in the day, as the sun grows hotter, the fog will burn off, but early in the morning, the air is heavy and you can feel the mist on your face. You can taste the salt in the air and hear the clanging of the masts and a fog horn in the distance. The world is at rest — peaceful and serene. It is a perfect time to commune with the Lord. The Slip of Dawn copyright© 2004 by G. Harvey is prohibited from being copied. G. Harvey art, sailboats, harbour, Focus on the Family, artwork, art work, canvases, images, paintings, pictures, and prints of The Slip of Dawn by artist G. Harvey for sale. The Slip of Dawn painting by artist G. Harvey can be purchased in art print or canvas form at special sale prices at Christ-Centered Art.